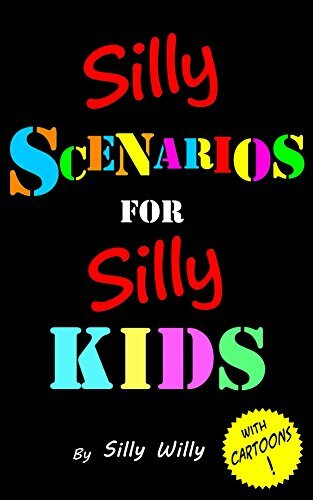 SILLY SCENARIOS FOR SILLY KIDS is a children’s conversation game book containing loads of silly questions with hilarious cartoons! The book contains a range of ‘would you rather‘ and ‘what would you do‘ style questions. The games are designed to help kids think and develop reasoning skills. Watch and listen to your kids as they think through their answers! Best of all, there are no wrong answers! Kids will be sharing some of these family friendly scenarios with everyone in no time! Ideal for travelling families or those who need some laughs on the school holidays! This family-friendly game book is entertainment for everyone of all ages! Great for beginner and early readers too! These puzzles will naturally start a conversation, even with those are a little shy! A perfect easy gift idea for boys and girls! But be warned, some of these scenarios are really, really, really silly! Would you rather …be able to talk to animals -or- be able to control people’s legs? Would you rather …meet a superhero’s sidekick -or- be a super villain? Would you rather …kiss all the people you meet -or- kiss all the pets you meet? Would you rather …skydive from a bus -or- skydive from outer space? Would you rather …have no control of your legs -or- no control of the volume of your voice? Would you rather …stay the same age forever -or- every year be a random age?